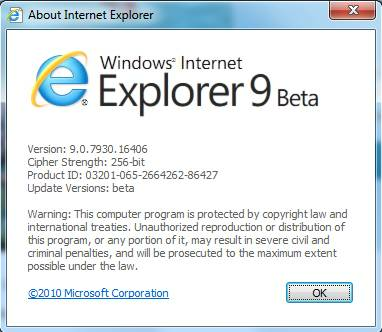 In this document, Windows users will find Microsoft Windows Internet Explorer 9 Beta version download links suitable for their Windows operating system as well as a short guide showing how to install Internet Explorer 9 (IE9 Beta) with screenshots. I tried to place some Internet Explorer 9 photos or IE9 screenshots in order to help you visualize how is your new web browser. If you are a web developer the new Windows Internet Explorer 9 has a claim to make websites shine and increase their performance like a native application running on your PC. Of course this means more attractive web applications with high performance for any web users during a surf on the net. Before downloading Windows Internet Explorer 9, users who wonder new features and the new product guideline for IE9, I strongly suggest to download the Internet Explorer 9 Beta Product Guide. This free downloadable IE9 product guide document outlines the new features and new enhancements of the Internet Explorer 9 Beta, and highlights top features. The product document of IE9 is also providing detailed information on the features which are specific for developers, IT professionals and end users. 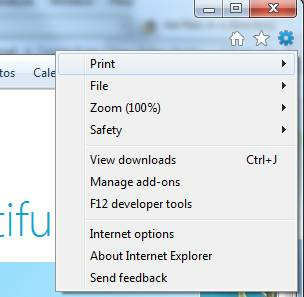 If you are searching for how to remove IE9, please refer to IE guide How to Uninstall Internet Explorer 9 - IE9 Removal. Here is a list of Internet Explorer 9 downloads for Microsoft Windows users. UPDATE : Windows users can now free download Internet Explorer 9 RC - IE9 Release Candidate (RC) version after the first beta releases. Microsoft Windows 7 users can use the below IE9 download links for their Win7 computers. According to their operating system Windows 7 and computer architecture (X64 or X86), Windows 7 users should prefer IE9 32 bit or Internet Explorer 9 64 bit editions. The setup file IE9-Windows7-x86-enu.exe for X86 or 32 bit Windows 7 has 19 MB size in total. The 64bit setup file IE9-Windows7-x64-enu.exe for Windows 7 is in 35.9MB size. Windows Server 2008 R2 64-bit users have different download or setup file from Windows Server 2008 users. So be sure that you are downloading the correct version of Internet Explorer 9. Otherwise when you start Internet Explorer 9 installation, a warning message will indicate wrong version or version mismatch and will not let continuning to IE9 setup. Windows Server 2008 R2 64-bit Edition users can download and install Windows Internet Explorer 9 from Microsoft Downloads portal. The setup file IE9-Windows7-x64-enu.exe is in 35.9MB size. Windows Vista and Windows Server 2008 users who have X86 operating systems installed on their computers can use the below IE9 download links. The setup file IE9-WindowsVista-x86-enu.exe is 19 MB in size. If your Windows Vista or Windows Server 2008 OS is running 64bit, then here is the Windows Internet Explorer 9 download links for Windows Vista 64-bit Edition and Windows Server 2008 64-bit Edition. The setup file for IE9 IE9-WindowsVista-x64-enu.exe is in 35.3MB size. Note that Microsoft Internet Explorer 9 Beta is compatible with Windows Vista SP2 and with Microsoft Windows 7. Unfortunately Internet Explorer 9 Beta is not compatible with Microsoft Windows XP regardless of Win XP Service Pack level. Click Install button in order to start IE9 installation. Process will install required updates for IE9 installtion. This process will take some time. The Windows IE9 installation will require restart or reboot computer in order to complete setup. After restart, when I first run Internet Explorer 9, the following message take my care at first. Speed up startup and browsing by disabling add-ons. I know that if I disable add-ons installed on a web browser, not only IE9, that is true for any web browser that browsing speed will increase, and web browser will have a better performance. But I choosed to think and make my decision later. It is also possible for an Internet Explorer 9 user to disable add-ons using the menu selections "Tools > Manage add-ons". When you open context menu by a right-click on the desired IE9 add-on, and by selecting "disable" submenu option, it is possible to disable add-ons on Windows Internet Explorer 9 (IE9). When you click the "Disable Add-on" button seen on the notification bar, a new screen called "Performance Advisor" will be displayed. Performance Advisor screen will display how long each installed IE add-on takes to load. This will help web users to decide to disable a web browser add-on or not based on load times. Internet Explorer add-ons enables web users personalize their Internet Explorer experience. Windows Internet Explorer users can find many IE add-ons for their browsers from IE Add-ons Gallery. And your new browser will navigate you to the following web address Welcome IE9 which is designed to show you the new Internet Explorer 9 features and how you can configure your Internet Explorer 9 settings and change them. I believe, Windows 7 users will love this new web browser Internet Explorer 9 more than any other IE versions and any other web browser like Firefox, or Google Chrome, etc. 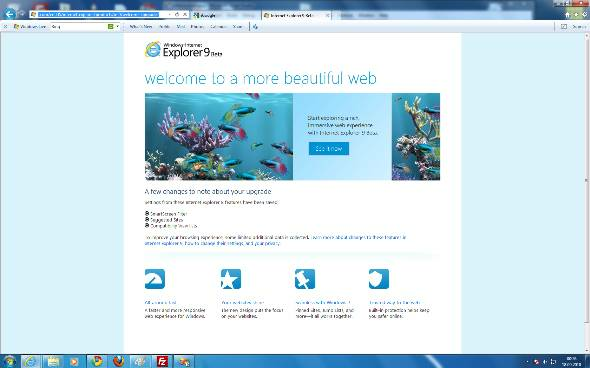 For more information about the new Internet Explorer 9 Beta, please visit the http://windows.microsoft.com/ie9 address.